December 21, 2015 - The Fed Raised Interest Rates. Now What? | OMH Partner Group, Inc.
After a brief rally after the Federal Reserve announced its historic decision, markets ended another choppy week in the red, battered by plummeting oil prices and rocky investor sentiment. For the week, the S&P 500 lost 0.34%, the Dow dropped 0.79%, and the NASDAQ fell 0.21%. If you're one of the millions of Americans who have better ways of spending time than watching the Federal Reserve, you may be wondering what will happen now that the Fed has voted to raise interest rates last week for the first time since 2006. 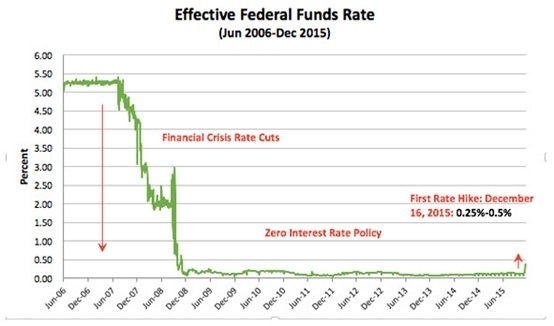 After years of historically low rates, the Fed voted to raise rate targets by just a fraction of a percent. Though we don't have definitive information about the pace of future rate increases, experts believe that the Fed is likely to raise rates several more times in 2016 and 2017, always assuming the economy remains on track for growth. Even if the Fed continues to raise rates regularly, it will take years to get back to historically average rates. We can expect the coming weeks to be volatile for both stocks and bonds as investors adjust to the new rate environment. Historically, markets have experienced volatility after rate increases and occasionally moved into correction territory (defined as pullbacks of 10% or more). However, stocks and bonds usually experience positive returns in the initial years after the Fed begins tightening policy. That being said, the past doesn't predict the future, and we'll be closely monitoring markets in the weeks and months to come. Bottom line: The Fed rate raise is not necessarily a bad thing. The hike underscores the fact that the U.S. economy has made tremendous progress in the last 7 years. However, the raise also comes at a time when millions of Americans are underemployed, inflation is still below targets, and global headwinds are blowing in the face of U.S. firms. Realistically, there was never going to be a perfect time to raise rates, and it's clear that the Fed is planning to take a gradual approach to future hikes. Can the economy maintain its pace of growth without the Fed's foot on the accelerator? We'll see. Housing starts increase sharply. Groundbreaking on new construction rebounded from a seven-month low and jumped 10.5% last month. Permits for new buildings also surged to a multi-month high, highlighting strength in the housing market. Weekly jobless claims fall. The number of Americans filing new claims for unemployment benefits dropped last week from a five-month high, suggesting that the labor market continues to improve. Inflation remains stable. A measure of inflation - the general increase in the cost of goods and services in the U.S. - remained flat in November. However, core prices that exclude volatile food and fuel increased by 0.2%, indicating that inflation is firming up. Industrial production drops in November. Warm weather and other factors drove the industrial sector of the economy lower by 0.6% last month. Though seasonal factors are affecting the data, lower global demand is making the effects more severe.